Can a space adapt to your stress levels? EMOTIV, UNStudio, and SCAPE have collaborated to raise awareness and tackle stress in the workplace via a fully immersive experience at the Milan Design Week Conference, called RESET (Responsive Emotional Transformation). RESET is a mobile, modular structure designed to include up to six different scientifically proven stress reduction methods. From intimacy to sound therapy, each unit provides a unique experience in a playful or interactive way. Shape, materiality, color, and light are parameters that can change per unit. 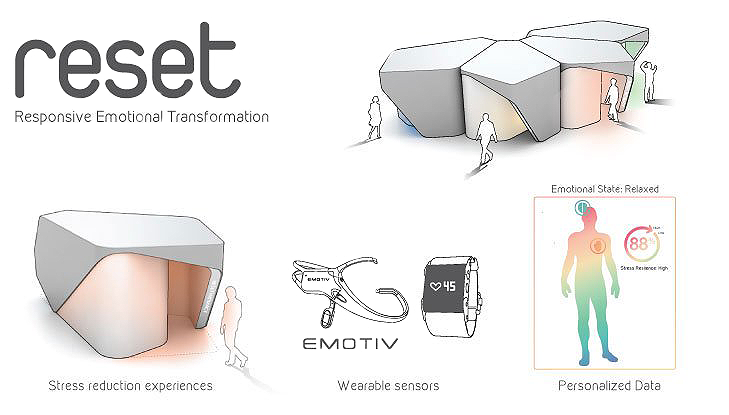 In RESET, EMOTIV’s Insight, along with heart sensors, provided biofeedback and monitoring of a user’s activity whilst also personalizing a user’s experience inside the pods.